The preparation of food as a creative act and communicative part of the common meal formed the main basis of the design analysis with my diploma thesis. To what extent can we reduce to basics these days without moving backward? What would a kitchen scenario look like if we take away all fancy cooking tools and electrical equipment? What do we really need to create good food and dine all together with our friends or family? My work is focused on the creation of the cooking experience not on the food itself. Traditional and original values are picked up and transformed into the present time. The project calls the rigid conditions of our daily kitchen live into question and suggests a new way of cooking and dining to keep this creative act as a social ritual alive. I investigated human needs to our modern daily life. The thoughts and solutions I developed build a flexible interaction between cooking, dining and social cohabitation. Always keeping the indi­vidual person in center of my attention. Single cooking elements have been designed. Each of them embodies one of my ideas and provides an answer in form of an object. The intension of this project was not to make the design for an entire kitchen interior but rather to bring out the aspects that seem the most essential to me. 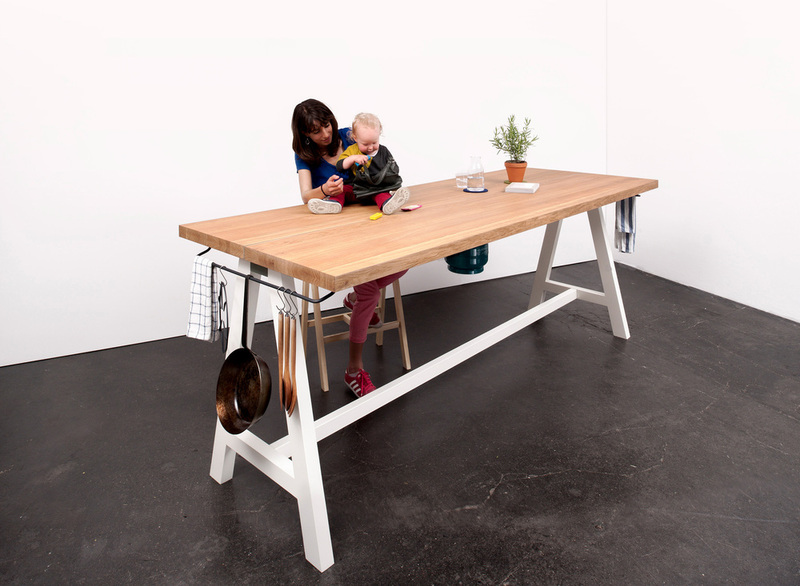 The Table brings the kitchen back into the heart of the home and forms the social centre of a household. It is the place were we meet in our daily life to rest, to communicate, to work or to play – alone or together. 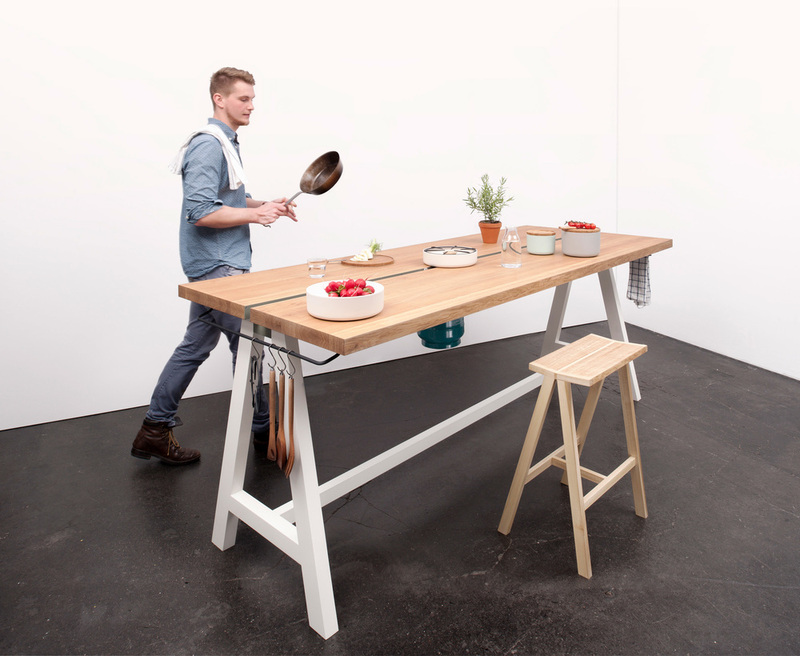 At the same time the table serves as a cooking table. The two parted flexible surface provides space to prepare food, to cook and to dine. 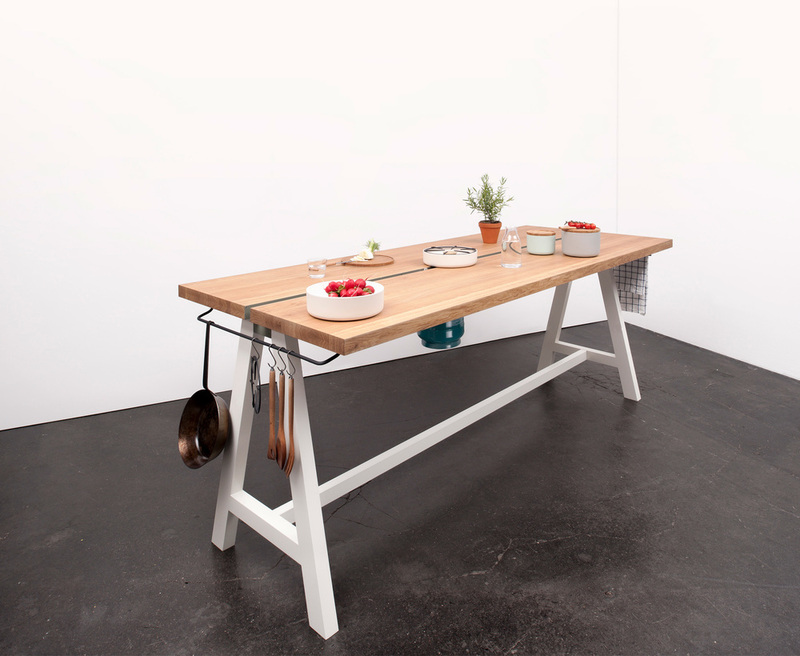 It is manufactured out of solid oak, the white trestle legs consist of powder coated metal. The fire realized as movable gas burners made of turned brass complete the product family, as well as the idea of the cooking scenario I developed. By pulling the two table tops apart, the gas burners can be clicked inside little modules with canisters attached underneath that slide in a hidden track along the centre. 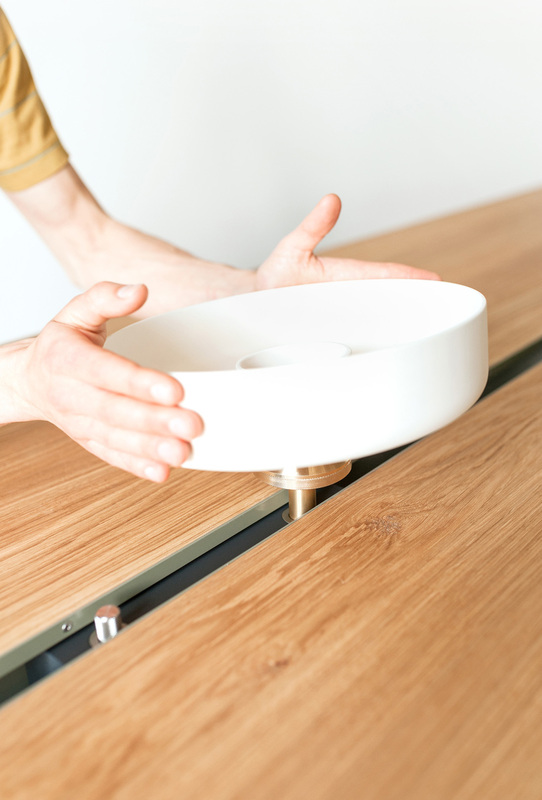 These modules can be moved easily by hands from one side of the table to the other. Thus the stove turns into flexible cooking tools that can be adapted to individual needs in terms of cooking position and number of integrated hobs. A circular ceramic bowl surrounding the gas burner while cooking serves as pad and heat isolation. The Cooking Table is part of my diplom thesis named Back to tomorrow, Dining culture through the change of time.